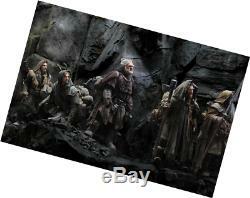 Blu-ray the hobbit and lord of the rings, the trilogies - collector's edition middle earth - vers. 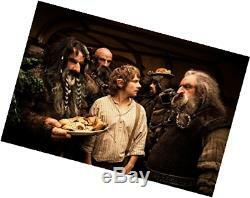 Actors: ian mckellen, freeman martin, john callen, peter hambleton, jed brophy. R & ## x9; alisateurs & ## xa0 ;: peter jackson. Audio: italian (dolby digital 5.1), english (dts-hd 6.1), english (dts-hd 7.1), french (dts-hd 6.1), french (dolby digital 5.1), french (dts-hd 7.1), french (dts dts-hd 5.1), castilian (dolby digital 5.1), French, Italian, English, Castilian. Subtitles: French, Dutch, English,ish, Italian. Subtitles for the deaf and hard of hearing: English, Italian. R & ## xe9; gion & ## xa0 ;: all the regions. Shape ratio: 2.40: 1. Number of Discs & ## xa0 ;: 30. DVD Release Date: November 16, 2016. Dur & ## xe9; e: 1245 minutes. 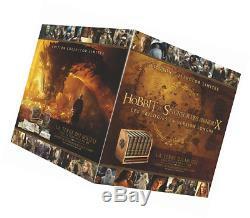 Collector's box limited & ## xe9; "middle earth" each movie (+ bonus) is about & ## xe9; in a faux leather book with gilding and embossing contains: - "the hobbit: an unexpected journey" (1 blu-ray of the movie in long version + 3 blu-ray bonus) - "the hobbit: the d & # xe9; smaug solation "(1 blu-ray of the movie in long version + 3 blu-ray bonuses) -" the hobbit: the battle of the five armies "(1 blu-ray of the movie in long version + 3 blu-ray bonus) - "Lord of the Rings - Community" of the ring "(2 blu-ray of the movie in long version + 4 bonus dvd) -" Lord of the Rings - both towers "(2 blu-ray movie in long version + 4 bonus dvd) -" Lord of the Rings - The Return of the King "(2 blu-ray of the movie in long version + 4 bonus dvd) - the" red book " from the West Market "with original drawings and 5 illustrations on loose leaves (100 pages) - 2 watercolor reproductions signed alan lee and john howe - 1 & ## xe9; tag & ## xe8; hobbit style storage cabinet, in wood, for 6 films and the book. 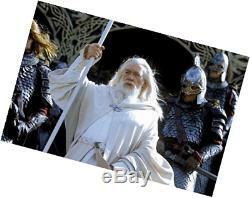 Contains: - the hobbit, the trilogy: recruits & ## xe9; by gandalf the gray, bilbon sacquet joins a band of 13 dwarfs whose chief is none other than the legendary warrior thorin & ## x9; cu-de-ch & ## xea; ne who seeks & ## xE0; take back the lost kingdom of the erebor dwarves, conquered by the fearsome dragon smaug. The lord of the rings, the trilogy: the young hobbit frodo saquet has the rite of a ring. This is the unique ring, an instrument of absolute power that would allow & ## xe0; sauron, lord of the temples, to reign on the middle ground and to enslave his peoples ... 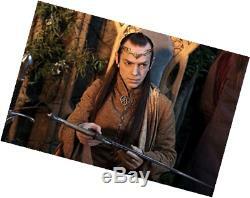 So begins the & ## # 9; xe9; lord of the rings trilogy pike, available in & ## x9; gralit & ## xe9; in this box! We are experts in our field with many years of experience. If you have any questions about our articles, do not hesitate to contact us, we will be more than happy to help you. We guarantee you that we do not know the answer to your question, we will answer you in the hours that follow. We also have experience in the manufacturing process of most of our products, so if you have any questions about how is manufactured or any other question, feel free to contact our team of experts. All our products are new and guaranteed. Free delivery in metropolitan France and belgium. Returns accepted within 30 days - provided the product is in original packaging. Media discount 77 is registered in France. 1 poplar street (chanteclair) 77177 brous on chantereine - france. An invoice will be sent to you by email once the payment has been received. 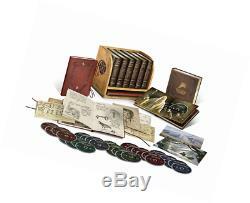 The item "blu-ray the hobbit and the lord of the rings, trilogies collector's edition" is on sale since Sunday, March 11, 2018. It is in the category "dvd, cinema \ dvd, blu-ray". The seller is "media-discount-77" and is located in / on chantereine.